There are various factors that make industrial robots such suitable tools for architects, and designers. Especially since architectural projects often require the fabrication of large, complex, three dimensional elements. What motivated you to organize a conference on robots in architecture? Sigrid Brell-Cokcan: While architects have been fascinated by robots for many decades (refer e.g. to Villemard in 1910 or Archigram’s Walking City) the use of “real” robots in architecture is quite new, pioneered by researchers such as Gramazio & Kohler. Today, more than 20 architecture faculties around the globe are using robotic arms. However, there wasn’t a common platform to exchange ideas and share knowledge, every team was basically working on their own. Johannes Braumann: The goal of Rob/Arch is to become a new platform for all interested in robots and architecture. Robotic fabrication is still a new topic for architects, artists, and designers, and there are now many young, enthusiastic people producing innovative projects. Rob/Arch gives them not only the possibility to present their research and projects to a wide audience consisting of both members of academia and industry, but also to take part in robot workshops distributed at partner workshops all over Europe, from Rotterdam, to Stuttgart, Zurich, Graz, and Vienna. Following the workshops, the two-day conference will take place in Vienna, where the results of the workshops and the research projects will be presented. What is the goal of the Association for Robots in Architecture? SB: Our goal is to make industrial robots accessible to the creative industry. To do that, we have a dual strategy. On the one hand, the Association acts as a network for robot users worldwide and hosts large events such as Rob/Arch, but also smaller robot workshops. 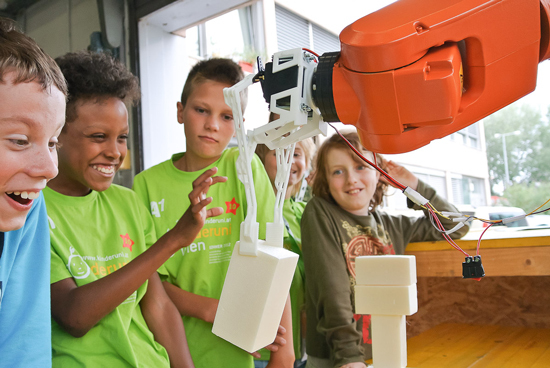 This year, we even had a robot workshop as part of Vienna’s children’s university program, where we had 20 children aged between 5 and 10 over, who interacted with the robots using devices such as Kinect. On the other hand, we also perform our own research and develop software tools such as KUKA/prc, which allow intuitive robot control out of CAD software. What makes industrial robots valuable tools for architects and designers? JB: There are various factors that make industrial robots such suitable tools for architects, and designers. Especially since architectural projects often require the fabrication of large, complex, three dimensional elements. Compared to regular five-axis CNC machines, robotic arms offer a much larger workspace at significantly lower costs. As tolerances of millimetres or even centimetres are commonplace on construction site, the robot’s lower accuracy isn’t a significant problem. 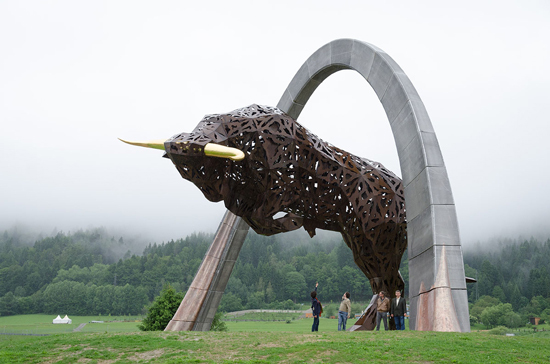 For the Red Bull Arch, a 17x23m aluminium arch by artists Clemens Neugebauer and Martin Koelldorfer, the 83 positive molds were programmed in KUKA/prc, and then milled using a 30.000EUR used robot and a 2.000EUR spindle. After a one-week workshop the artists were able to robotically fabricate the molds themselves, even though they didn’t have any previous experience with either CAD or CAM. Such a low-cost workflow just isn’t possible with regular CNC machines. The Red Bull Arch, aluminium-cast using 83 robotically fabricated positive molds. SB: It’s also important to note that architects and designers are not only using the robotic arms for “traditional” fabrication, but are also exploring the use of robots in an artistic way. There are projects where robots paint with light, are used as 3D printers, or even move cameras in the movie industry. Quite a few of these exciting projects will also be presented at Rob/Arch. Is there anything you are looking for from robot manufacturers or software that you think is missing or could be improved? SB: We are very happy with the hardware themselves, we’ve been using KUKA robots for more than 6 years and they just keep running. Regarding the software, we started out mostly with milling, and had a very complicated workflow: We had to design the geometry in CAD, generate toolpaths in CAM, and then simulate the robot in the robot postprocessor. Whenever there was something wrong in the end, we had to change to the previous software and do it all over again. Furthermore, we wanted to be freer in regards to path planning, and not limited to the milling strategies of the CAM software. 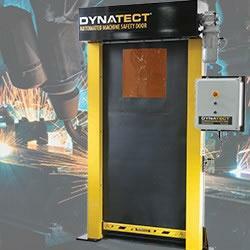 This prompted us to develop our own tools, which finally resulted in KUKA/prc. The available tools are very good at what they do, the problem was basically that we wanted to do more. Could you tell us a little about Grasshopper and your plugin (KUKA/prc) and how it differs from other design software? JB: Well, Grasshopper is a visual programming environment, where different modules are connected with each other graphically. This parametric modelling, where you push and pull a slider and some geometry changes, is very important in architecture and design, where you iterate through many possibilities before settling on a design. We wanted to use this powerful environment not just for the generation of geometry, but also for the actual robotic fabrication. Grasshopper’s plug and play system is very intuitive, and our KUKA/prc system integrates seamlessly into the parametric environment. You can plug and unplug different end-effectors or even different robot types, and whenever you change the geometry, you immediately see the effect this has on the robot simulation. Before, Sigrid mentioned the workflow from CAD to robotic fabrication; with KUKA/prc, we don’t need three software suites anymore, but can basically do it all in one environment, that architects and designers already know very well. Where do you see industrial robots in the future of architecture? JB: This will be a very important question at Rob/Arch – where do we go next? When you look at the wide range of robotic projects, it’s already clear that there will not be just one answer for that. However, we strongly believe that robots will become more and more important in the construction industry, especially on-site fabrication. SB: You can’t just take a CNC machine and place it somewhere on a construction site. However, robotic arms are easy to transport and not too heavy. They can even be placed on mobile platforms, such as KUKA’s Omnimove. So this will definitely be an area where much will be happening, along with many other research areas. There are already plans to host the next Rob/Arch conference in 2014 in the US, so it will be very interesting to look back in two years and see if we were right. The Association for Robots in Architecture has been pioneering the easy use of industrial robots for the creative industry and has authored multiple peer-reviewed papers on the use of robots in architecture. They are participating in international research and industry projects and have recently become KUKA System partners. 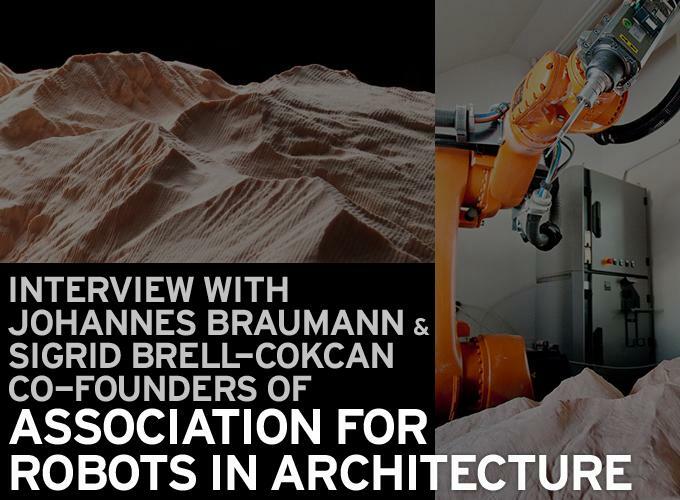 Sigrid Brell-Cokcan and Johannes Braumann are co-founders of the Association for Robots in Architecture and organizers of the Rob/Arch 2012 conference. They are board-members of the trans-disciplinary research association, along with robot expert Eric Dokulil. Sigrid Brell-Cokcan is a professional architect with her own successful architecture firm II Architects int in Istanbul and Vienna. Johannes Braumann is the main developer of KUKA/prc. The exciting combination of robotics and architecture will be the topic of interest this December in Vienna. Initiated by Sigrid Brell-Cokcan and Johannes Braumann, co-founders of the Association for Robots in Architecture, the “Rob/Arch – Robotic Fabrication in Architecture, Art, and Design” conference will bring researchers and professionals, as well as architects, artists, and designers interested in new technologies to Vienna University of Technology. Prior to the conference, eight parallel robot-workshops led by internationally recognized specialists from institutions such as the University of Stuttgart, TU Delft, ETH Zurich, TU Graz, SciArc, University of Michigan, Harvard, and TU Vienna will take place at four locations distributed throughout Europe. The workshops are held on December 14th to 16th, immersing participants to cutting-edge robotic research. The conference has been met with significant interest from industry. KUKA Robotics from Augsburg/Germany is Rob/Arch’s main sponsor. ABB and Staubli Robotics, gripping technology specialist Schunk, and milling-experts A2 also kindly support the conference. The workshops are sponsored by security expert Euchner, steel construction firm Zeman, software developer McNeel, and the Austrian composite start-up SuperTex. KUKA Robotics will award the “KUKA Young Potential” grant worth €2000 for the best scientific paper by a young researcher of less than 35 years.